The moth-eye disperses light across its lens as a form of camouflage. Most moths are nocturnal. They rely on their ability to look like their surroundings to hide. The eye itself dampens light to eliminate a reflection of light that would give away their position. However, because most of the moths are nocturnal, they need light to be easily let into their eye. The moth-eye grid allows for greater photon reception - meaning it makes the image clearer. Moths don’t have eye lids on their compound eyes. They rely on the grids in their eyes to allow them to be active during the night and rest during the day. The light coming into their eye hits the grid and is dispersed across the area of the surface. When a narrow beam of light enters the grid, it is dispersed over a large area without decreasing the amount of light that passes through it. This dispersion of light makes it less intense. It is then let into the eye. 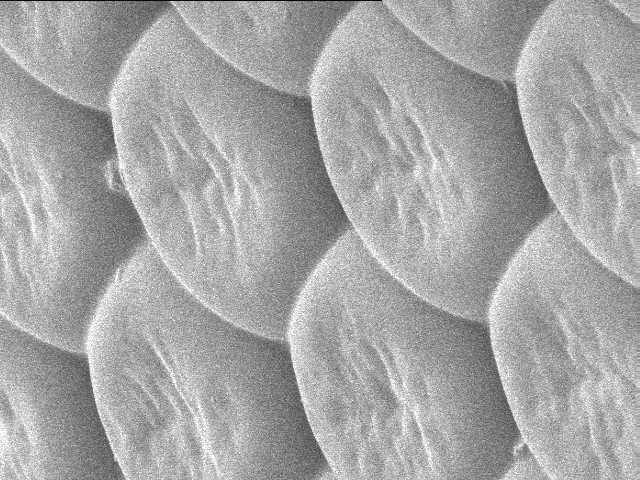 Shown above is the compound eye of the average deerfly. The light first enters the lens and then one of four crystalline cone cells which focus the light onto a photoreceptor cell. The crystalline cones act as magnifying glasses making the image sharper. The light is then passed to the ommatidium, or the receptor unit, which sends the image to the brain. This "fly-eye grid" is an efficient reflector of white light at up to 60 degrees, and is a relatively good anti-reflector at angles greater than 60 degrees. The grid would be particularly useful on a curved surface1rather than a flat surface. On the curved surface, it would increase the transmission of incident light through the cornea of the fly, or any other curved transparent surface. The eyes of the Lepidoptera (insects with scaled wings such as butterflies and moths) work extremely well at 10 degrees to the surface normal. If there was a surface at 45 degrees, the moth-eye grid would work quite well. It is perfectly functional from 35-55 degrees. The moth eye is not strictly limited to the 35-55 degrees, but the 35-55 degrees are the best antireflective section when dealing with an intense light condition. These moth-eye applications can be etched into a surface using a embossing feature, or a stamping process. For example, if light is coming from a source of 50 degrees, and using the same 45 degree surface from before, the light would be greatly deflected and dispersed across the surface. This difference would be similar to staring at an LED light displaying 100 lumens of light and a candle displaying 100 lumens of light. To the eye, the LED is stronger because the same amount of light is emitted from a smaller area. The candle seems less intense because it is dispersed over a wider area. This is how the moth-eye works. 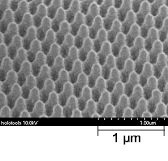 When light enters a moth-eye grid it is dispersed across the grid and passes through it to the other side. The other side of the grid is still receiving the same amount of light, but over a larger area. Shown below is a moth-eye application under a microscope.